Ed’s Fencing, Inc. specializes in beautiful residential wood fence work. Tell Ed’s Fencing what style you want, and we will deliver! 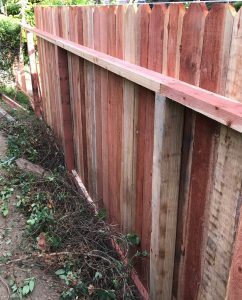 Since 1939, Ed’s Fencing has been providing Los Angeles and Orange County with quality wood fence. In California, redwood fence is plentiful and is a very beautiful addition to your home. Redwood is an exceptional choice of wood fence for your home because of its ability to last and adapt without twisting and warping due to inclement weather. However, we also provide other woods such as cedar fence, split rail fence, pine fence, and most other wood fence materials. All styles of wood fencing are provided, from dogear fence, to cap and trim, and all other residential wood fencing styles. Ed’s fencing is also quick and efficient at taking down fence if you are in need of a fence removal. As an experienced wood fence company and licensed contractor, Ed’s prides itself on exceptional levels of professionalism. We install fences all over LA and OC including Long Beach, Palos Verdes, Costa Mesa, and Huntington Beach. Click below for your free quote today, or give us a call!